Best Method: E-mail a 2D DXF file and PDF with overall dimensions. Also include in the email; part quantity and material. Only include the part geometry that will be waterjet cut (perimeter and through holes/cut-outs), no dimensions, notes etc. needed. Add a 1" x 1" square with an "X" in it near the part geometry, this is used to check scaling. NOTE: If your part will require additional machining or forming other than just waterjet cutting, include a PDF file of the dimensioned part drawing. Generate a PDF file of your part drawing from your CAD software. The drawing would have all the needed dimensions (in inches), tolerances, and notes to make the part from. Acceptable: E-mail, Fax, or send Drawings/Sketches. An actual part could be shipped to us. NOTE: These methods may incur additional engineering charges to generate the DXF geometry. and be cut faster at less cost. 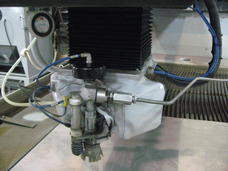 Why should your parts be cut by a waterjet over a laser? No thickness limitations up to 6". No issues with reflective materials such as brass, copper, and aluminum. No heat input, so there is no heat-affected zone (HAZ). Hardened materials can be cut with no change in temper. Waterjets can cut materials which are heat sensitive such as plastics, rubber, or composites, and even such materials as glass, stone, and very hard ceramics. If you are through-cutting the perimeter and holes, rather than blind holes or pockets, the abrasive waterjet is typically much faster, easier to program and cheaper than milling. This is due to cutting a part with one pass, and not having to reduce all the metal to chip form. In addition, there is minimal setup and fixturing time. .....over plasma or oxy fuel? Plasma is a hot process. It adds a great deal of heat to the product, leaving a heat-affected zone. The surface finish of the abrasive waterjet part is generally better. It leaves almost no dross on the backside of the part, reducing secondary operations. Abrasive waterjet parts can be much more closely nested also. Tolerances:+/-0.005" on most parts. By running slower feed rates, certain parts the tolerance can be +/-0.002". Minimum hole size of 0.090" diameter. Square inside corner geometry will cut to a 0.020" radius. Larger inside or outside radius corner will cut slightly faster (less cost). Maximum material thickness is 6"